Looking at a goalie today, you’ll see state-of-the-art technologically advanced gear from head to toe, as a way to help protect from injury. But if you look back at the game many years ago, you’d see something far different. In fact, you’d actually see more of the actual goalie, because the gear they wore was pretty sparse and minimal. One of the biggest differences you’d see is that back in the late 1950’s, goalies did not even wear masks. Today that is unheard of (and illegal), but back then it wasn’t part of the uniform and players didn’t see the need for it. According to a Chicago Tribune article on the evolution of goalie gear, the last goalie to play without a facemask in the NHL was Pittsburgh’s Andy Brown (1974). Aside from facemasks, goalie gear back in the day was pretty much one-size-fits-all, which seems crazy when you think about the size difference of players. 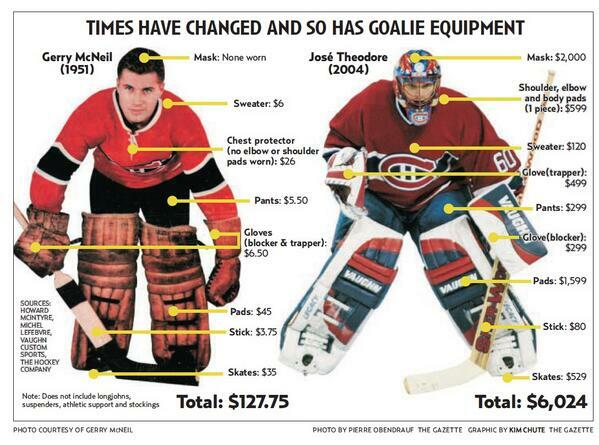 Nothing was custom and it often fit baggy, which meant that it wasn’t always doing its job of projecting the goalie. A lot of hockey equipment and uniforms were not waterproof so players were weighted down by excess sweat and melted ice, which dramatically changed what they were able to do on the ice (i.e. how quickly they could move). 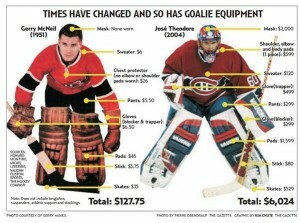 Read more about the evolution of goalie gear and rule 11 here, via another great article from the Chicago Tribune. Interested in reading more about the history and evolution of the goalie mask? Check out this USA Hockey Magazine timeline. If you’re looking to step up your goalie gear or update your goalie stick or have other hockey needs, be sure to check out Hockey World today and don’t forget about our Best Price Guarantee.